Pucker up, Zebra. You don’t smell so great yourself! I think that this is the first time that I’ve drawn a recognizable zebra. That is to say, it’s recognizable as a zebra, not necessarily any zebras I recognize. Not that I have anything against zebras, mind you. 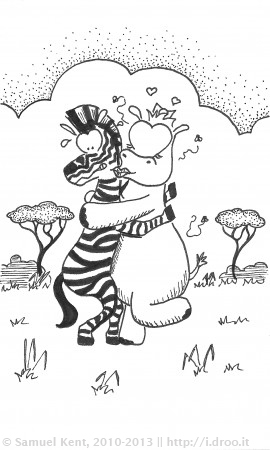 Zebras are good people. Er, herd animals. I just don’t get out much.